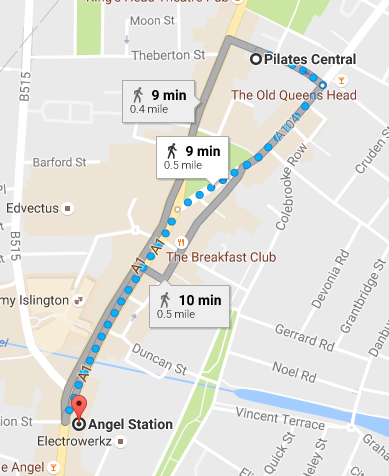 Pilates Central is a short bus ride from the Angel tube station on Islington High Street. So if you’re looking for a pilates studio in Islington you’ve come to the right place! for a friendly no obligation chat. Although Pilates is now more widely known about, there are still a surprising number of people who have never even heard of it. Regardless of whether you can tell your Pilates Reformer from your Pilates band, we have compiled five informative facts about Pilates, which you may be interested to know. Joseph Pilates was the creator of Pilates, yet, during his lifetime the form of exercise we now know of as Pilates was actually called Contrology. It wasn’t until after his death in 1967 that this system of exercise became known as the Pilates Method. The name Contrology originated from the concept: the art of control. Pilates believed that the person performing the exercise should be in constant control of their body movement. This control helped to keep the exercises safe and prevent injuries. Pilates is less about how much you do each session and more about employing the proper method for executing each movement. At the same time as performing the movement correctly it should be combined with the correct breathing. This ensures you derive maximum benefit from each exercise. As there is a real art to Pilates, an expert instructor is key to exercising efficiently and safely. A popular misconception is that Pilates isn’t really suitable for men. This is simply untrue as many elite sportsmen choose to incorporate Pilates into their training programmes. Perhaps you are an avid golfer or skier; spend many hours desk-bound and sedentary; or suffer from a specific musculoskeletal problem such as lower or upper back pain. In all these cases, Pilates has something to offer you regardless of your gender. Men who use Pilates as part of their regular workout regime notice positive functional and aesthetic changes. Pilates is an extremely effective tool in injury rehabilitation. In fact, its popularity amongst physical therapists appears to be steadily growing. Part of its appeal is its inherent adaptability. Instructors are able to completely tailor Pilates exercises to the injured person. This includes being able to choose from basic to advanced movements according to the degree of injury and the person’s rate of progress. If you have an injury, it is important to find an instructor who has the training and expertise to work with injury rehabilitation. The holistic nature of Pilates means it is a total mind and body workout. The concentration required to execute the movements and the focus on controlling your breathing are both positive benefits from Pilates. You will also reap the usual benefits from exercising such as increased endorphins, stress release, and better sleep due to expending energy. To find out more about Pilates courses near in Islington, pop along to our studio in Gaskin Street or give us a call. All routes run along Upper Street, right past Gaskin Street. All run along Essex Road, past the southern end of Gaskin Street. All run past Angel tube station, a five-minute walk from Gaskin Street. "I have found the classes hugely beneficial. Physically, I feel stronger, fitter and more flexible and have twice the energy I had before. I ..."
"I'm 69, with a body carrying many traces of rugby, skiing and boxing "impacts". "What made me start Pilates was a lower back ..."
"Two years ago I first walked into Pilates Central in Islington. It suited me - a bad-back sufferer - because it was barely used ..."
"I have been going to Pilates Central for three years now. I go two or three times a week and it always makes me ..."
"I wanted to improve my bad posture and a friend suggested Pilates. Even during the initial assessment at Pilates Central I felt immediately in ..."
"For 16 years I have done Pilates wherever I am in the world. In Islington I attend Pilates Central, and I can honestly say ..."
"Pilates Central offers a unique experience; unlike in a group Pilates class, you can tailor your session to your exact needs. You get to ..."
"…It has a quiet ease and elegance that belies its superb professionalism. The exercises are overseen by gentle and encouraging staff – exercises that ..."